NASSAU, The Bahamas --- Domestic violence/relational disputes are a major cause for the surge in violent crime in the region, accounting for an astonishing 25 per cent of the murders committed in the Caribbean. Minister of National Security, Dr. the Hon. 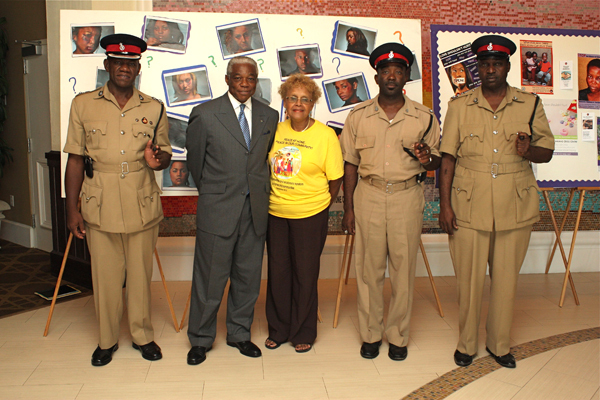 Bernard J. Nottage, said statistics indicate that almost 1,200 cases of domestic violence are reported annually within The Bahamas. “However, according to the Bahamas Crisis Centre, the number of cases are actually higher when reports that they receive from other sources are considered,” Dr. Nottage added. Dr. Nottage said the re-introduction of the Urban Renewal Programme is one of the vehicles the Christie Administration has implemented, or will implement, to reduce the incidences of domestic violence within the country. “The impact of the family, the church and the schools on behaviour has lessened considerably, and is seen to be a problem in western societies in general,” Dr. Nottage said. “Your presence here is evidence that the countries within our region are all seeking answers to the problems of domestic violence. It also underscores the importance of collaboration among partners to root out the spectre of this appalling crime from among us. “We must continue to put our collective minds together in pursuing solutions to our social problems if we are going to make the region safe for ourselves, for those who visit us, and for our future generations. We must find the solutions if we are to achieve our countries’ national objectives for economic growth and development,” Dr. Nottage added. Dr. Nottage said given the “multidimensional approaches” that are being undertaken to break the cycle of violence in regional communities, it appears that emphasis must still be placed on preventative measures. “We must deal with the causes of crime. We know that much of the violence that takes place is - to a great extent - rooted in deep social issues,” Dr. Nottage said. “We (therefore) have to understand the root causes behind violent and criminal behaviour and seek to change individual and social circumstances that give rise to such behaviour. “We must increase our efforts to get ordinary citizens themselves playing their part in rooting out the causes of crime. We need to develop responsible communities that do not tolerate criminality; that are willing to report crimes when they see them, and refuse to protect or cover up for the criminals. We need to ensure that criminals and their supporters are not held in high regard in their communities by virtue of the financial support that they bring into the community,” Dr. Nottage added. Dr. Nottage said it was exactly this same type of thinking that served as the impetus for the reintroduction of the Urban Renewal Programme by the Perry G. Christie Administration upon its return to office four months ago. “That is why my Government has placed strong emphasis on the Urban Renewal Programme that seeks to ascertain the socio-economic conditions that exist at the household and community levels (as) r esearch that has been conducted on domestic and sexual violence indicates that it affects persons of all ages, social, ethnic and economic strata,” Dr. Nottage said. “I trust that you will leave this conference having agreed to additional strategies and programmes that can be implemented to bring about a greater degree of peace in our homes and in our communities. My Government stands ready to make the necessary investments in this area as we see it as key to the security of our people and the development of our nation,” Dr. Nottage added.